To view tudor portraits currently for sale at Philip Mould & Co, please go to www.philipmould.com. Recent dendrochronological dating has established that the panel on which the present portrait was painted was most probably felled c.1506. 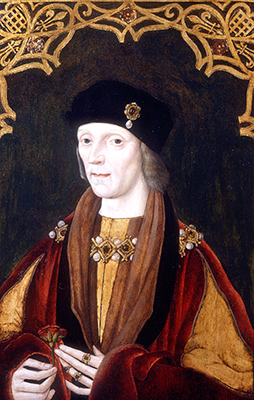 This fact, combined with the unusually high quality of execution revealed by the removal of old overpaint, suggests that this painting was produced by a native workshop during the lifetime of King Henry VII as a valuable icon of the reigning sovereign, and not, for example, as a posthumous token likeness produced and hung as part of a set to decorate a corridor or gallery. Further, the painting’s very close resemblance to a portrait formerly in the collection of Lord Brownlow (Sir Roy Strong Tudor and Jacobean Portraits NPG London HMSO 1969 p. 151) argues that the two likenesses were produced by the same workshop, very probably working from a lost life original. The King’s apparent age in the portraits also agrees with a dating to ‘late in [the King’s] life circa 1500’ (Strong loc cit). Both portraits, in addition to the obvious similarities of composition, detail and characterisation, frame the top of the arched panel with the same illusionistic trellis. This motif, which incorporates the Tudor royal badges of rose and portcullis, also appears in a portrait of the King’s wife Elizabeth of York (Duke of Hamilton Collection) which, however, is of cruder execution and smaller dimensions,.and lacks the distinctive finesse of the present portrait. Conservation has revealed a work of jewel-like beauty. It can be placed in continuity with earlier royal likenesses in its small scale and meticulous attention to the details of jewellery and costume – the rings on the king’s fingers, for example, are treated with the minute almost miniturist’s detail familiar from royal portraits in the English tradition such as King Henry V (known from later copies such as the portrait in the collection of the National Portrait Gallery, London), but its characterisation looks forward to the sixteenth century concept of likeness. The King’s tight-lipped expression, the fine lines depicted about the eyes and the overall air of shrewdness express so well the character of the wily survivor and ruthless administrator familiar to the historian of Henry’s reign. Of itself a portrait of Henry VII datable to the sitter’s lifetime would be an object of considerable rarity. The pattern for his portraiture remains largely unvaried, and as Strong observes, the usual portrait type is exemplified by the present painting, the chief variation between versions being whether the king is turned to the right (as in the portraits in the Royal Collection, Christ Church , Oxford, the collections of the Duke of Northumberland, Lord Tollemache and elsewhere) or the left as in the present example, as well as the portraits in the collection of the Marquess of Salisbury as well as the Brownlow portrait and the portrait in the collection of JH Schmidt van Gelder. The exact age of the other examples has not yet been established, however, which lends the present painting an importance beyond their already apparent pre-eminence in quality. Like those familiar, potent icons of King Henry – the portrait by Michael von Sittow (National Portrait Gallery, London) or the terracotta bust by Pietro Torrigiano (Victoria and Albert Museum, London) these portraits bear the authentic aura of the early sixteenth century. Iconographically their equivalent is perhaps – of not Torrigiano’s terracotta – then the tomb effigy in Westminster Abbey, produced not from the life but from the close study of a life image. Such images as these take us back to the very dawn of easel portraiture in England, and their implications in the growing sophistication of portrait representation in this country, or in the evident flourishing of artistic workshops are considerable. Whether the studio practice and the means for transmission of images such as these arrived in this country by coincidence in the years c.1500, or whether Henry himself specifically encouraged it is not certain. But like his son Henry VIII and his granddaughter Elizabeth, Henry thoroughly understood both the necessity and the methods of effective propaganda. Henry had gained his throne through conquest, and the head of large army, but his claim to the English throne was comparatively weak – he had it in right of his mother Margaret Beaufort heiress of John of Gaunt, and the driving purpose of his twenty reign was to cement his and his heirs’ authority and their hold on the Crown. To this end he married Elizabeth of York, daughter of King Edward IV in 1485, the year that he defeated King Richard III at Bosworth Field. But he also recognised the totemic power of symbols. In 1501 at a feast to celebrate the marriage of his son and heir Arthur Prince of Wales to Princess Catherine of Aragon held at Richmond Palace he had displayed a chronological series of portraits of English monarchs which was presented as a progression from earliest times to his own rule, and culminated in his own portrait, presumably a likeness of a pattern very similar to the present example. The measurements of this portrait – 12 ½ x 9 inches – are smaller than the dimensions of the present portrait, but the pattern would appear to be the same. It is not known when the other two portraits of the king left the Royal Collection, nor whether their dimensions were similar to the present portrait. The portraits of Henry that are now in the Royal Collection as part of two separate and later sets of monarchs are comparatively recent acquisitions.